This year, I stayed in and baked these chocolatey peperminty cookies! The first Christmas cookie to grace my kitchen this year! I love to make holiday cookies, well actually any kind of cookie! I’m not one for the fussy kind of baking though, I like rustic, tasty, yummy food. This is probably why I never went into cake decorating, LOL! I got the idea from my pumpkin kiss cookies that I did last year. You are probably familiar with the classic peanut butter and chocolate kiss cookie, but peppermint and peanut butter sounds awful together! 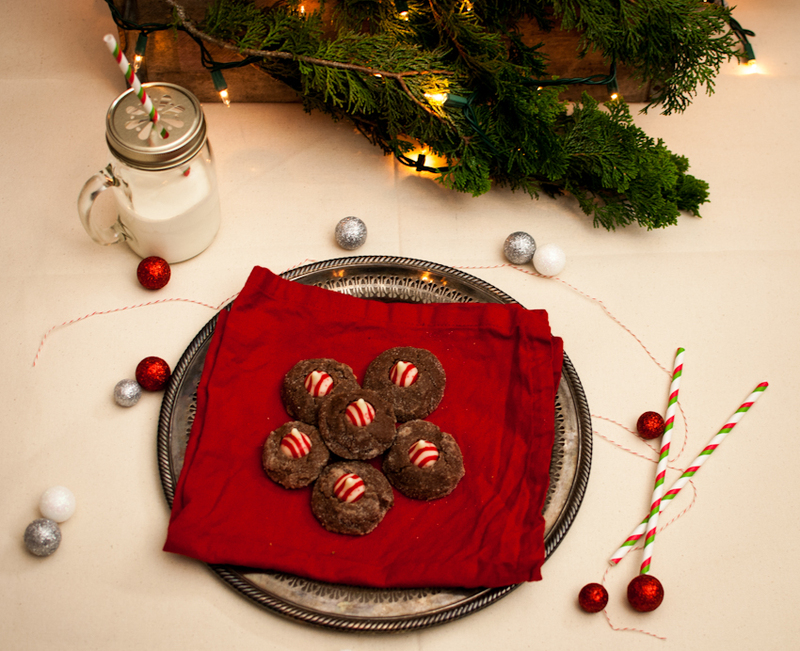 Chocolate and peppermint are much better together. 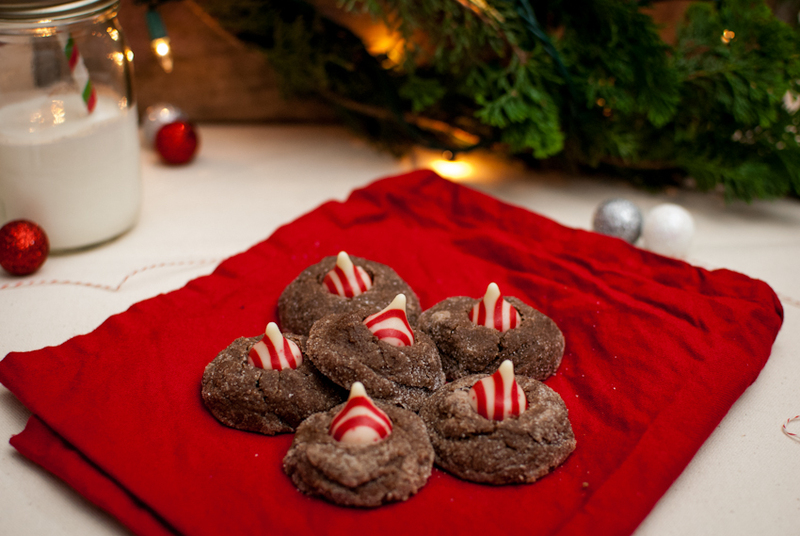 You could also leave out the cocoa, add a tad more flour and make these a white sugar cookie. Instead of rolling in sugar, roll the dough in red or green sprinkles for a more festive colored cookie. I do suggest doing some prep before making your dough, it will save you some time. I unwrapped the whole bag of kisses and put them in the freezer until I was ready to use them. If you put a room temperature kiss on a hot cookie, it melts very quickly and you will have a puddle of red and white chocolate on your cookie, not very pretty. Next mix your dough, then bake. When these come out of the oven, press the kiss immediately into the cookie and place the tray in the freezer for about 15 minutes to set the kisses. Oh, and if you did go shopping this year, I hope you scored some good stuff and maybe one of your friends baked you some yummy cookies while you were out! Unwrap all the kisses and put in a bowl in the freezer until ready to use. With an electric mixer in a large bowl, mix together butter and sugar until creamy.Add eggs and vanilla. In a separate bowl, combine flour, cocoa powder, baking powder, salt and cinnamon. Add half the flour mixture to the butter/sugar mixture. Slowly add 1-2 tbsp of buttermilk. Then add the rest of the flour mixture and buttermilk. Mix until combined, dough will be a little stiff but not crumbly. Add more buttermilk if too crumbly. Spoon about a teaspoonful of dough, and roll into balls. Roll into bowl of sugar. Place on cookie sheet lined with parchment paper and bake for 9-10 mins at 375 degrees. 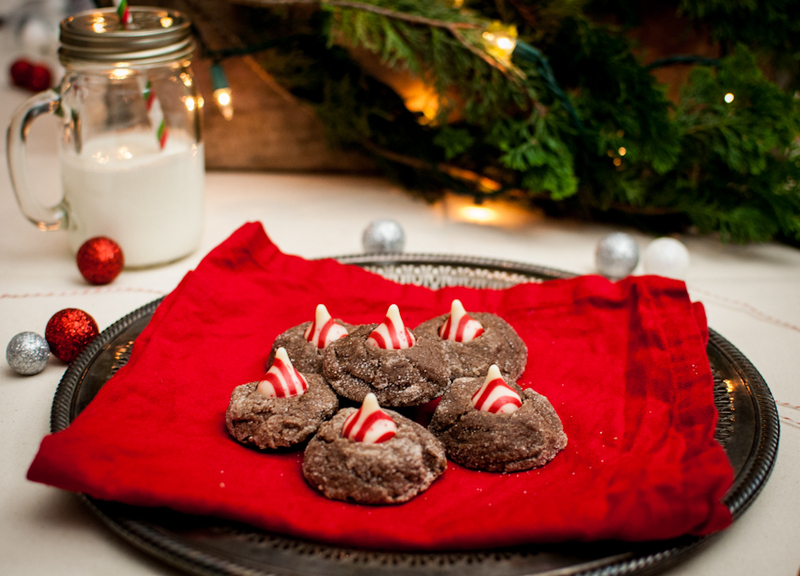 When cookies are done baking, quickly place a frozen candy cane kiss on each cookie, pushing down slightly. Place them in the freezer for 15 minutes to set kisses. I love this season – all the treats look so festive! Great tip about freezing the kisses!! I make a similar recipe this time of year that I love–these look delicious!